New Products and Services from Elle Photography! Recently I started to think how I can make changes to my business and ultimately serve my clients better. I’ve already implemented some of these changes in 2018 but things are now shifting into high gear and I am so excited about these. Let me explain. When I speak to past clients (or new clients) and ask them what they did with that disk, I (or past photographers) gave them, they usually say, “Honestly, nothing. I don’t even know where it is or I don’t even have a CD drive in my new computer”. And I totally get that, life gets busy and time moves on. Technology changes fast and before you know it that CD or thumb drive is scratched, corrupt or out of date. My job as photographer is not complete until I’ve helped my clients figure out what to do with the images we created, rather than just handing you digitals and saying “good luck figuring out what to do with these”. I want to help create products that you can enjoy every day and pass down to future generations. I now offer wall art design services, free of charge, to my clients. You’ll get to see exactly what your photos will look like on your own walls, at the right size. This will allow you to “try it before you buy it” so you know exactly what you’re getting before you place your order and this will make it simple to finally get those photos off of the thumb drive and onto the walls where they belong. After you’ve made your choice, you can sit back and relax. I’ll take care of everything for you from here. I’ll have your photos professionally printed by professional printing labs and that comes with a lifetime guarantee. Final products are inspected and checked for quality before delivering to you. I will even install these so we can finish off the project like it was planned out from our design meeting. Did I mention - everything IS DONE FOR YOU?!!! This will give you VALUABLE FREE TIME!! I repeat…FREE TIME to enjoy other things. All you have to do is to look forward to seeing these products on your walls and in your hands in just a few weeks. 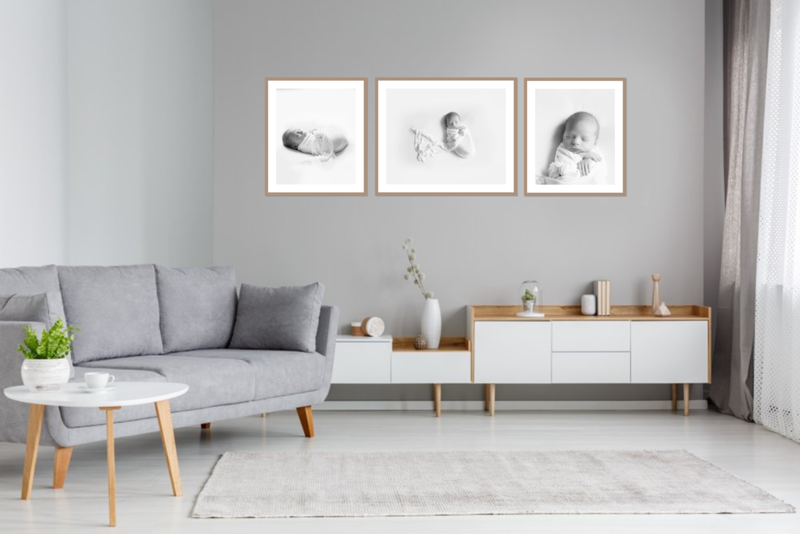 To celebrate this launch I’ll be sending past clients an email shortly offering them a complimentary wall gallery design from their past sessions (I still have them on file) and with a special offer on these galleries if they’d like to get them up on their walls. I can’t wait for them to see what I can create for them. Harper was 10 days old but born 2 weeks earlier than expected. We had some fun with a Star-War fanatic dad and they ordered a custom gallery wrap of her dressed as Princess Leia. How fun. Here is another suggestion to use her photos in a unique way. I love showing clients how their photos may look on a wall. I use either stock photos of my own but even better, you send me your rooms and we’ll calibrate it and make sure we order the size you need. No regrets afterwards on a wrong size.